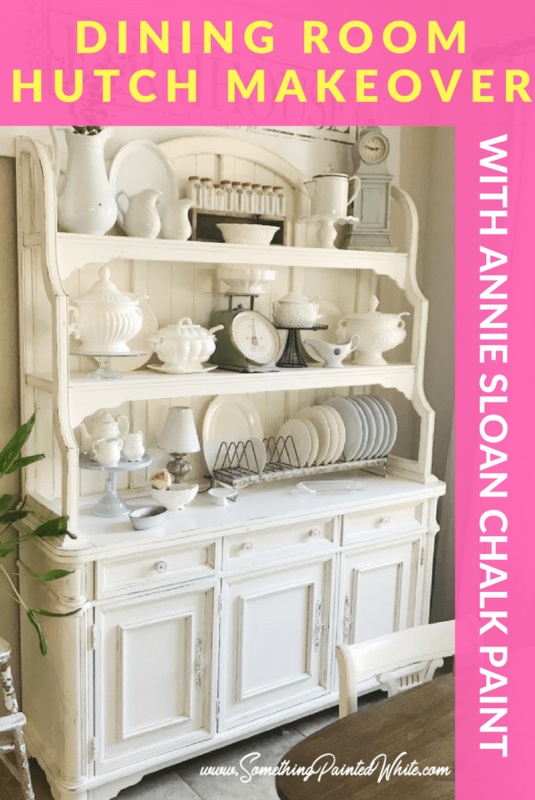 I love White Dishes…displayed proudly on a dining room hutch! No, I mean, I really LOVE white dishes! They all make me so happy and I love perusing the thrift stores for them. there was no good place to display them. I don’t want to tuck them away, I want to look at them all the time. 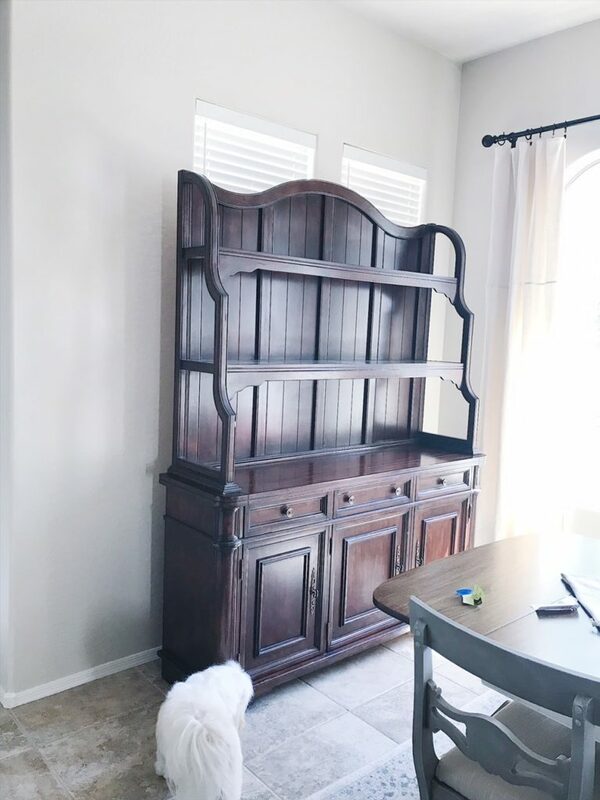 It was obvious, I needed a dining room hutch! The tricky part was figuring out where to put it since we only have two walls in our dining room and both of them are covered in windows. Hmmmmm. 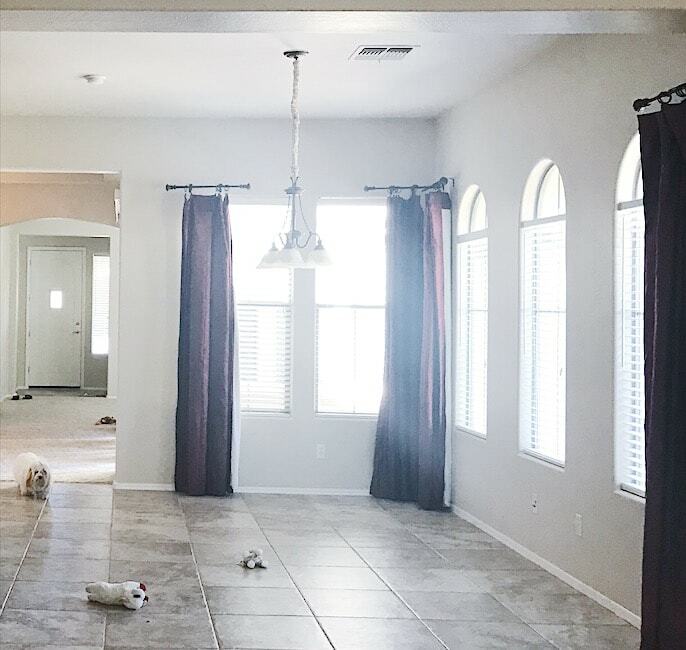 This is how the dining room looked the day we got the keys. 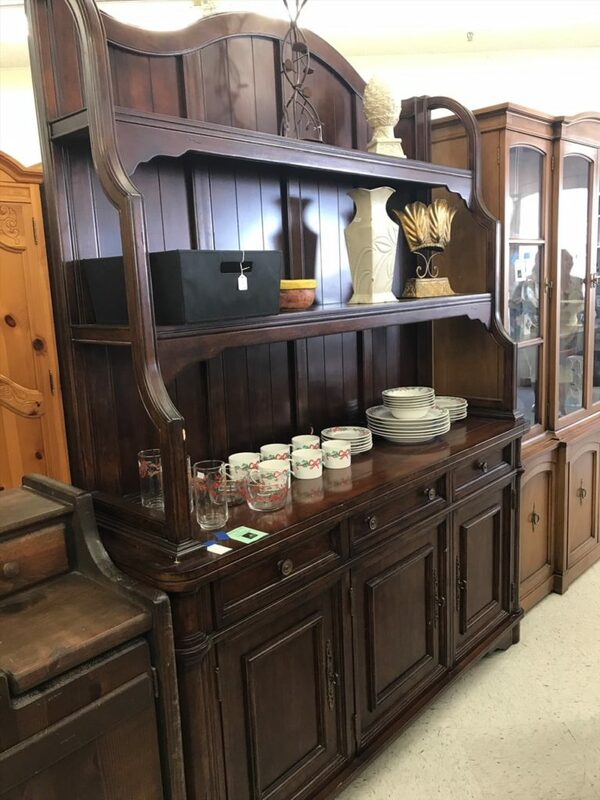 but not just any hutch…this hutch needed to speak to me. I checked yard sales….online yard sales…Goodwill….Offer Up and various local thrift stores. When I found one that I loved…I didn’t love the price. When I found a price I loved, I didn’t love the hutch. This is how she looked when we first met. I was smitten! 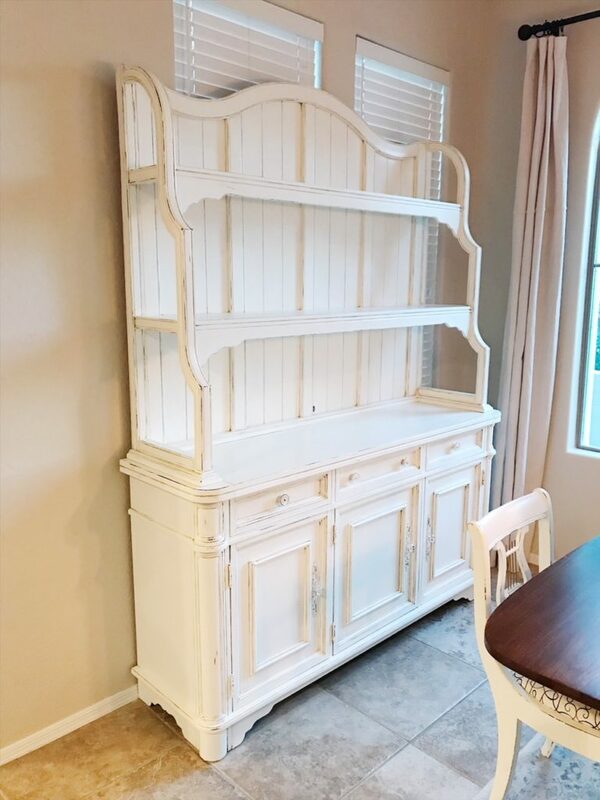 Something about it spoke to me…the curves on the upper half….the beadboard look behind the shelves…the open top shelf…the convenient little slot for holding plates (what’s that called anyway? a plate slot?) anyhow…I also loved the storage it had on the lower half. Then I touched it...this beauty was legit. Solid, heavy, hard wood. The price tag at $250.00 was a bit more than I really wanted to pay, but OHHHHHH, I loved it!!! I left. Yep...I walked away! I wanted a better price! But I couldn’t stop thinking about that hutch. It was perfect and was (almost) the perfect width and height to cover my windows. It haunted me! Since I had taken a photo of it at the store I kept looking at it. I’m pretty sure it became more perfect with every glance. But alas, it was more than I wanted to pay. So I moved on. after visiting my mom, I stopped by the same store to see if they had any more hutches. They did! Nothing spectacular though. But….this haunting sweetheart was still there…AND STILL THE SAME PRICE! I knew what I had to do!!! I had to buy it…FOR LESS!!! So I found a sweet little lady and asked her very politely if they would come down on the price since it’s been sitting there for 4 weeks. They drive a hard bargain and wouldn’t budge. Could I walk away again??? I thought about it…but then she said she would throw in FREE delivery! One very long week later it was delivered and placed perfectly in my dining room…right in front of those two windows that, in my opinion, served no purpose on that particular wall. Even the delivery men complimented me on my beautiful find. 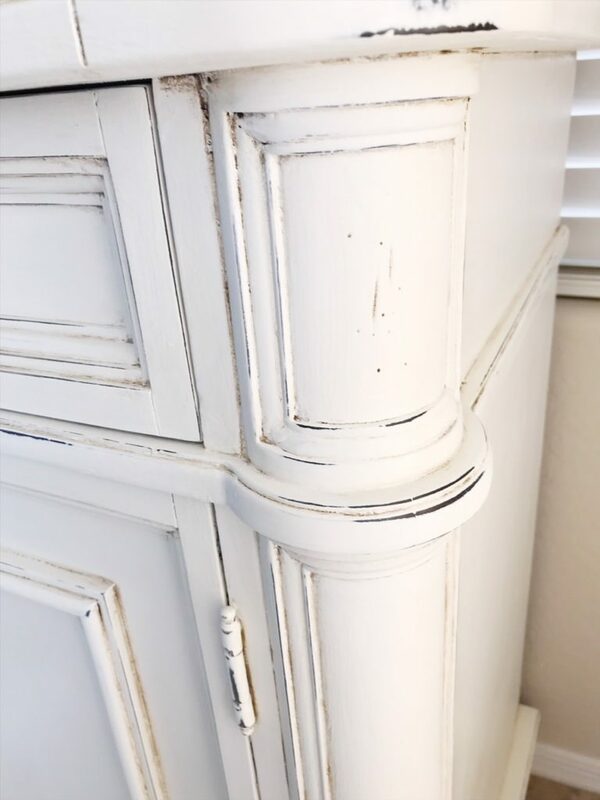 I knew I wanted to paint it a nice creamy white so, on the advice of my friend Bridget at Grungy Galz I used Annie Sloan Chalk Paint and mixed Old White with Pure White. Bridget had a few gorgeous pieces in the store with this same color and I loved it! 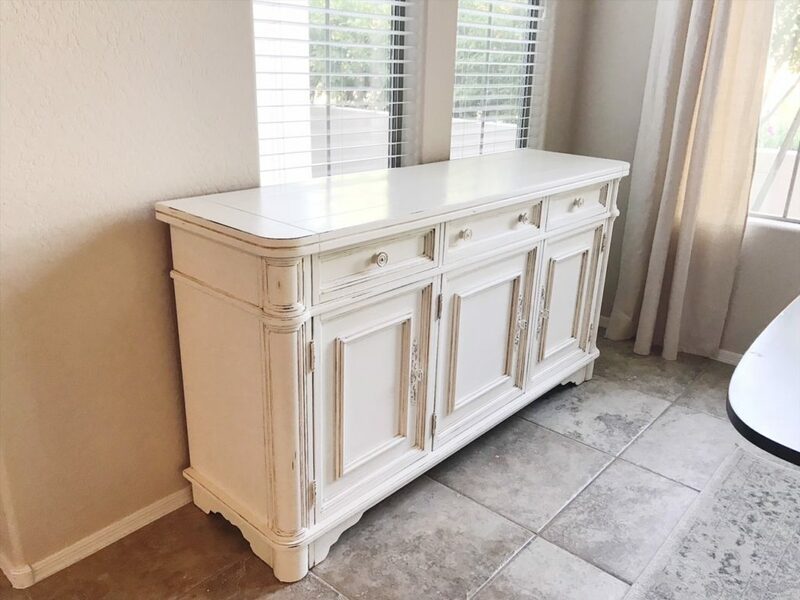 Since this Dining Room Hutch was so dark I was concerned that it would be difficult to cover. Bridget gave me some great advice…Shellac it! HUH??? Yep!!! By putting a couple coats of Zinsser Bulls-eye Shellac on it I didn’t have to use as much chalk paint to cover it. The shellac prevents the dark color from bleeding through. 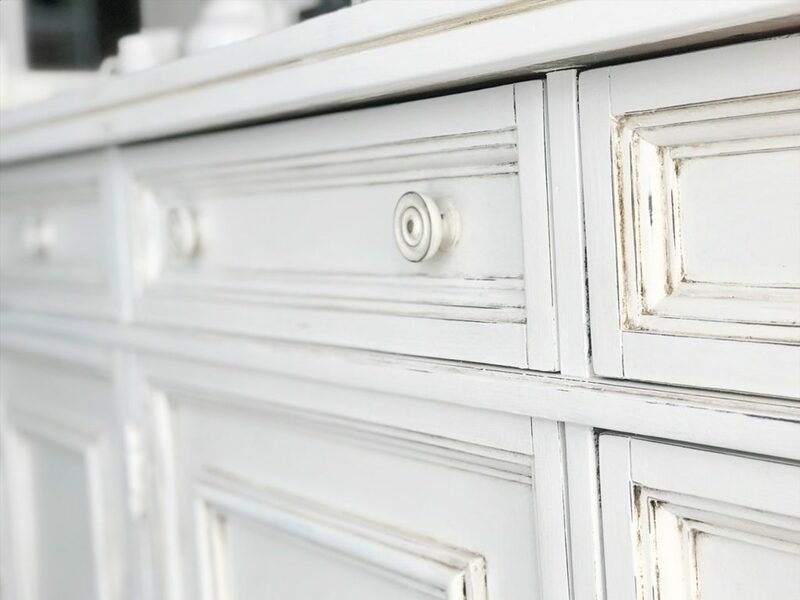 It seems a little odd at first…but it works…and trust me…shellac is cheaper than chalk paint and I like my projects to be as economical as possible. I ended up putting 2 coats of shellac on just to be safe. Honestly, I hated the extra time it took, but I wanted it to be right and I’m really glad I followed Bridget’s advice. Finally I was ready to paint! Oh My Goodness, It’s going to be Wonderful!!! so I decided, when I was about half done with the upper section, to carry it into the living room and lay it on it’s back. That made it much easier to paint under the shelves. I had to paint EVERY part of that upper section because I didn’t want anyone sitting at the table to see any unfinished spots. Painting the lower section was much easier and went pretty fast. 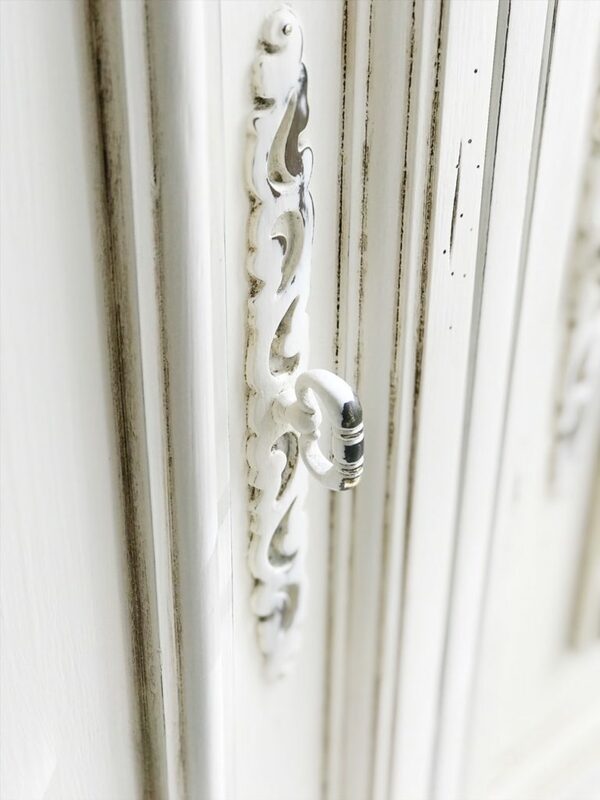 I decided to paint right over the gorgeous hardware, mostly because I’m lazy and didn’t want to take it off, but it really is gorgeous and the final result is so pretty! What’s not to love about this hardware? It’s too dark. But I can fix that. 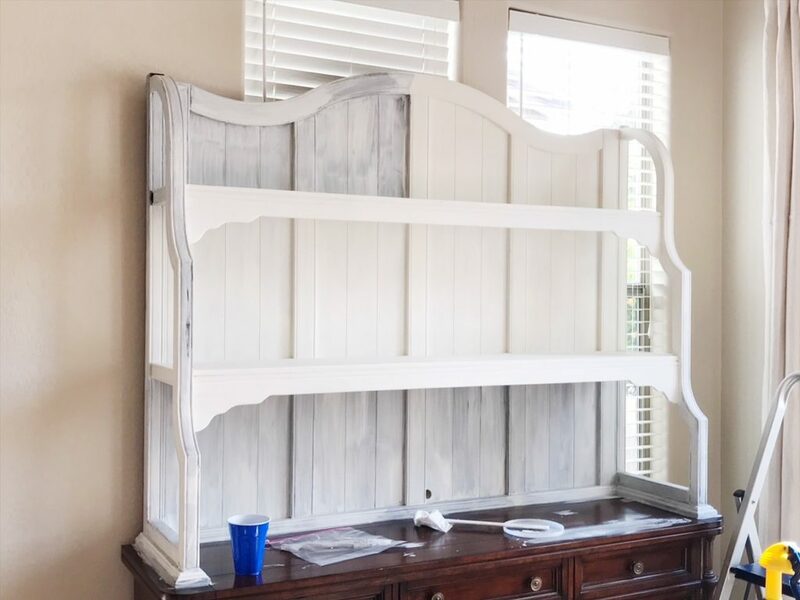 Painting over the original hardware made for a gorgeous result! 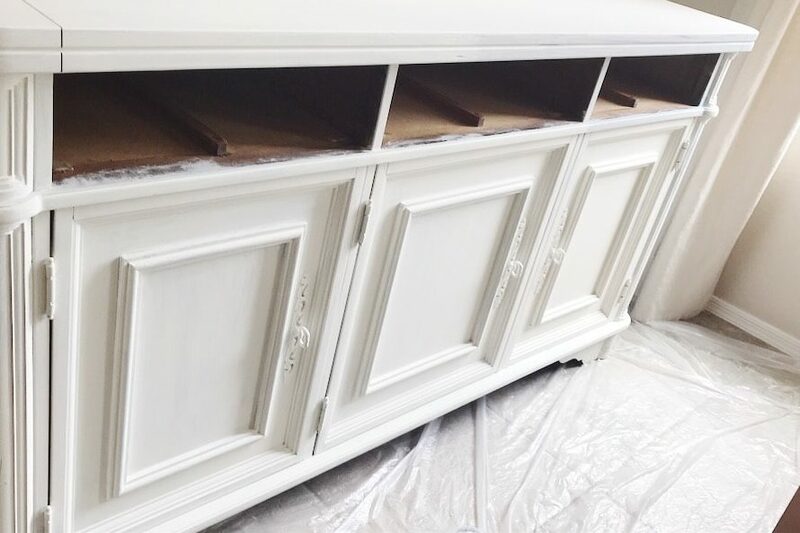 I ended up painting 3 coats of Annie Sloan Chalk Paint on this hutch because I really wanted to make sure it was covered. This is how it looked after the paint and before the distressing and waxing! on just about all of the furniture pieces that I redo for our home. 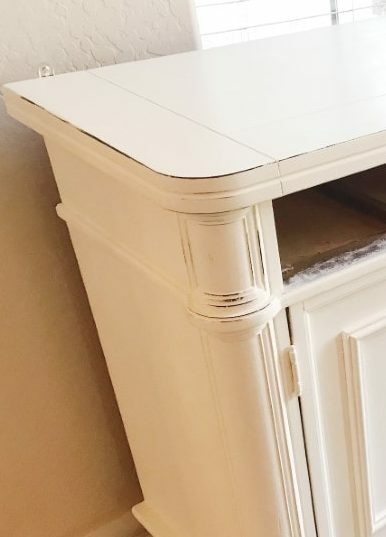 One of the many things I love about using chalk paint is how easy it is to sand off the high points and edges. I typically paint indoors so i use a wet sanding sponge for this step because it really helps to keep the dust down and the paint comes off so easily. Distressing in progress with a wet sanding sponge. for waxing… mine is to distress first and wax second. But the sanding isn’t always enough distressing for me. Before and After Dark wax. I love the aged look the wax gives it. for the waxing process because it gets into the tiny detail areas much better than a cloth. It’s important to have two wax brushes….one for clear…one for dark. As I’ve said before, I like to be as economical as possible, and wax brushes can be really pricey. I found this one on Amazon and it had great reviews, I haven’t used it on a lot of projects but so far so good. 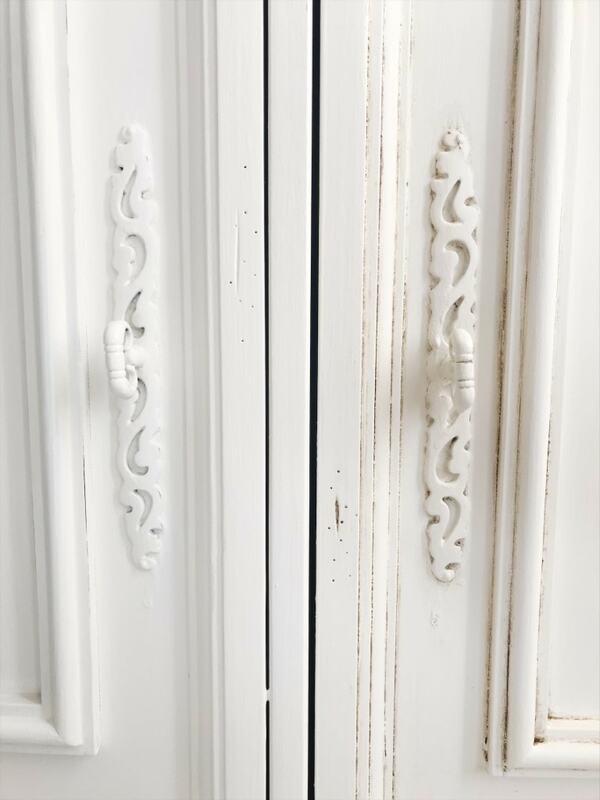 The original hardware, the dark wax in the details, the creamy color….it’s just what I hoped it would be. Bye Bye Windows.! I love the shine you can get from wax. So pretty! That’s a wrap! Now it’s time to fill it with dishes! Woot!!! 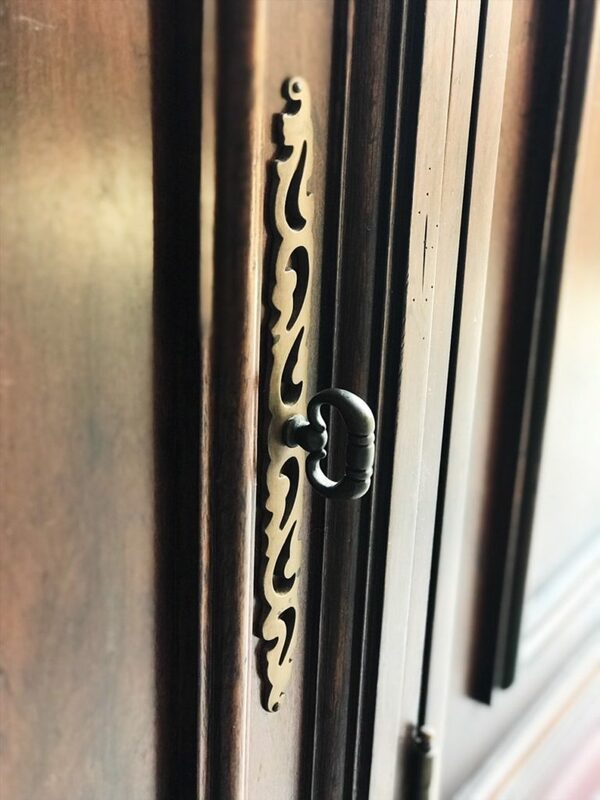 This Dining Room Hutch was such a fun project! If you have a favorite thrift store be sure to stop in regularly…you just never know what beauty awaits you there!